Bald eagles congregate along the Chilkat river, near Haines, Alaska, in November. Perched in the dormant Cottonwood trees. Click on the image above to view a larger version of this photo. I’m sure all of the photographers reading this blog have written a business plan. Right? I mean, we’re all professional photographers, running our private small business with all the acumen and diligence of a studied businessman/woman. Right? I wonder how many photographers out there calling themselves “professionals” have ever sat down and written an actual business plan. For their actual business. My guess, is very few of us have done so. My guess, in fact, is that virtually every single photographer reading this post will spend more time on “liking” posts and “+1ing” comments and pictures on various social media than they will on mapping out some kind, any kind, of business plan. Rather than find 10 new facebook friends, or 25 new twitter followers for your business, how about spend 10 minutes working on your business plan? It’s a difficult thing to do. Most of the tutelage we might find, or have learned, about business plans, doesn’t quite seem to fit what we do, does it? I don’t run a studio, or have employees and board meetings. I mean, what purpose does it serve for me to write a 2-3 page “Executive Summary”? For that matter, what purpose does it really serve me to sit down and map out a budget for the year for my business? I’m more concerned with a budget for my rent and my food and my power utility, right? I’m more concerned with my budget for gas in my car than a budget for my business. Particularly if my business is simply some kind of imaginary friend. A business should have a budget. And it should also have some kind of business plan. Even a simple map of ideas, constraints, forecasts and projections, objectives, hopes, aims. And so on. Anything, to be honest, is better than nothing. So, here’s a suggestion. Or a challenge. Actually, a 2 part challenge. Part 1 – get started. Anyone out there interested in actually building a photography business, and I’m sure that includes at least SOME of you, sit down and do some research on putting a business plan together. At the very least, learn something about what a business plan is. Part 2 – make a list of 5 things you know you need to be doing to improve your photography business that you’re not currently doing. That’s all. 5 things. Don’t include things you should be doing better, or that you’re kinda doing, or have taken a stab at doing. Think of 5 things you’re not doing. List them, and be specific, and brief. Don’t list something stupid like ‘take better pictures’, or infinite like ‘send out more submissions’. Those are subheadings. In and of themselves, they’re extremely lame. Be specific. “Send a DVD of images to my stock agent this Friday” is a better idea. So do it. 5. That’s all. Do that. It’s good for you. 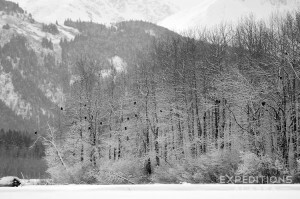 This entry was posted in Alaska, Photo business, Photography and tagged Bald eagles on January 8, 2013 by Carl D.